Hey everyone, our next Atlanta Real Estate Investors Alliance Meeting is on Monday, September 6th, 2010 at 5:30 PM at the Doubletree Hotel in Roswell GA. Yes, this is the Labor Day holiday for all of you with J.O.B.s. But for the rest of us, Labor Day is just another day since every day is a job free holiday. So if you have a job, enjoy the weekend and better part of Monday with your friends and family, and then come out and join us at 5:30 PM and celebrate what may be your Last Labor Day. Then you can spend the rest of the year working with your new real estate investor association to achieve the financial freedom you want and deserve so you can “lose your job” and join the ranks of the “self unemployed”! We are absolutely not suggesting that you quit your job, but that you do indeed start to work toward financial independence through real estate investing. As you know, many investors make more money off a single deal or two than many of their friends and family members make all year and you can too! 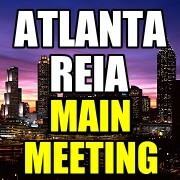 At our next Atlanta REIA Main Meeting on Sept 6th, we will not only be celebrating your last Labor Day, but we will also be announcing our new membership programs, how you can become a charter member and we also want to get your input on our upcoming educational programs for the next year. After all, at Atlanta REIA, your real estate success is our mission and we want to give you what you want and need. So come out and join us on Labor Day!